Clematis is one of the plants that adds vertical elegance to any small garden or to a small perennial bed. 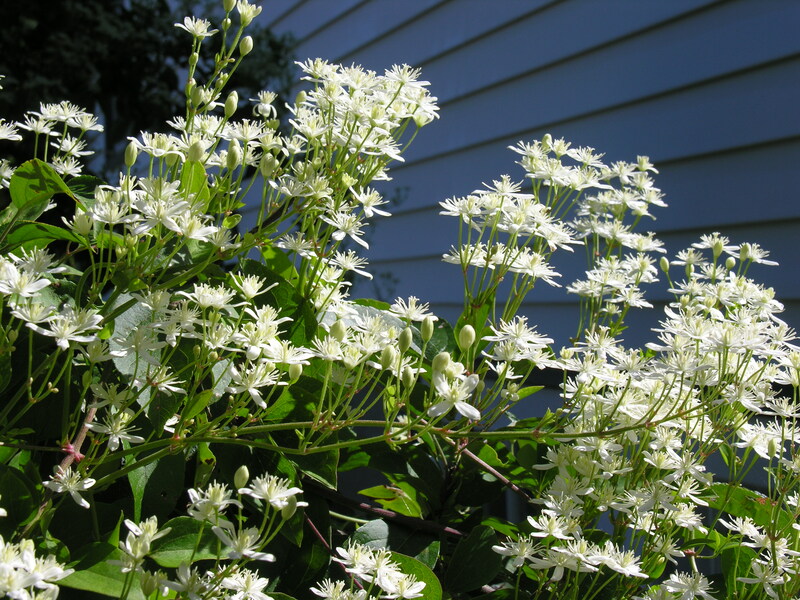 And, since there are various types of clematis that bloom at different times these plants can also add color to the garden in spring, summer, and fall. So, when I designed my garden a number of years ago it seemed like a no-brainer to plant sweet autumn clematis since it blooms in September. If you’ve never seen one in bloom you can’t imagine how beautiful it looks growing on a trellis, an arbor, or a porch railing. It is soft and it falls in cascades of small white flowers that have a lovely fragrance. Well, folks, it turns out I planted a relative of Audrey, the man-eating plant in Little Shop of Horrors! Three years ago, I decided that the sweet autumn clematis was getting much too large in its location (it keeps sending up new shoots so even pruning doesn’t solve the problem) on the corner of my porch so I dug it up. I did this very carefully and, I thought, very thoroughly because leaving even a snippet of root in the soil will result in propagation of a new plant. There was not a sign of my Audrey again until this year. New plants appeared in three locations along the side porch rail – at the three trellises where I had planted other clematis plants! Is that amazing. Not only did this plant reconstitute itself but it selected exactly the locations where it could grow undetected until it was in bloom (full size and six feet tall). Now, after tearing the three of them down I will still have an annual battle unless I dig up all of the clematis plants and other plants in the bed in order to destroy the root (ha ha). Not only that, but when I cleaned out another nearby bed I found sweet autumn clematis shoots here and there…about five of them. Now I was even more than upset and I wanted to know how this was happening so I asked a fellow master gardener. Apparently, it propagates by seeds driven by the wind and I can expect to find them anywhere in the yard! The only way to control this “reseeding” is to deadhead every spent flower. My advice to you: never plant an invasive plant in your garden.